The RM-77 2x Lighted RimFree Magnifier from Carson Optical magnifier from Carson offers 2x magnification and bright white LED illumination of the viewing area. 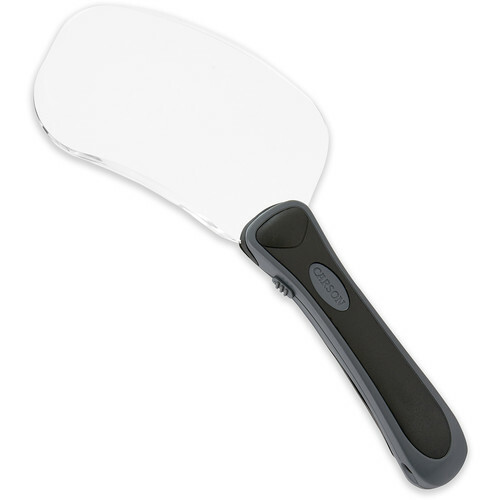 An ergonomically designed soft-grip rubber handle ensures comfort during extended periods of use. A rimless crystal-clear rectangular acrylic lens provides a crisp distortion-free view. This magnifier is a great low vision aid and assists in reading small print. It operates on three #389 button cells (included) and comes with a soft case for storage. Box Dimensions (LxWxH) 11.8 x 5.3 x 2.2"
RM-77 2x Lighted RimFree Magnifier is rated 4.0 out of 5 by 1. Rated 4 out of 5 by Rodney L. from Very Handy and Useful I purchased this product to read fine print such is serial numbers on camera and computer gear and product codes. I discovered that it works really well for seeing dust and grime on camera lenses. In direct sunlight I discovered that my camera lens filter contained both dust and gime. When I went in to clean it, I could not see the dust and grime under the office floresent lighting. Using this magnifier I could see everything and after cleaning confirm that that the filter was squeaky clean. I docked one star because the pruduct uses expensive button batteries rather than inexpensive AAA batteries.